Disclosure: This is not a sponsored post. I was sent a pair of Javie Flats in exchange for an honest review. All words and opinions expressed are 100% my own. If you could go into my shoe stash I give you my word that you would find nothing but flats, running shoes and converse. My feet solely rely on that type of footwear. Do I not love high heels? Why yes, yes I do. But thanks to my feet and tendency to trip and fall flat on my face, I try to avoid them at all cost. Unless there's a party or a very special event and they are needed, then they are taken out of a secret little corner, where they await to one day be worn. Flats are definitely shoes that I am always on the hunt for. I love design and color and when I find cute ones I always tend to buy them. I don't really care if they don't match, which sorry to say that most of the time they don't. I feel like that's what sometimes makes my outfit pop, someone is looking at you and then they look at your shoes and Bam! With there being so many shoe companies promising to give you comfort and style, it can be hard to shop around. Especially when you spy a pair of shoes that you think is really cute and then you are hit with the +$100 price tag. I know that a lot of people have the possibility to spend that kind of money on a pair of shoes but not everyone can, that includes me. Being a mom of two, who is a stay at home mom and only husband works it can be hard to splurge on shoes, especially when you are addicted to them. 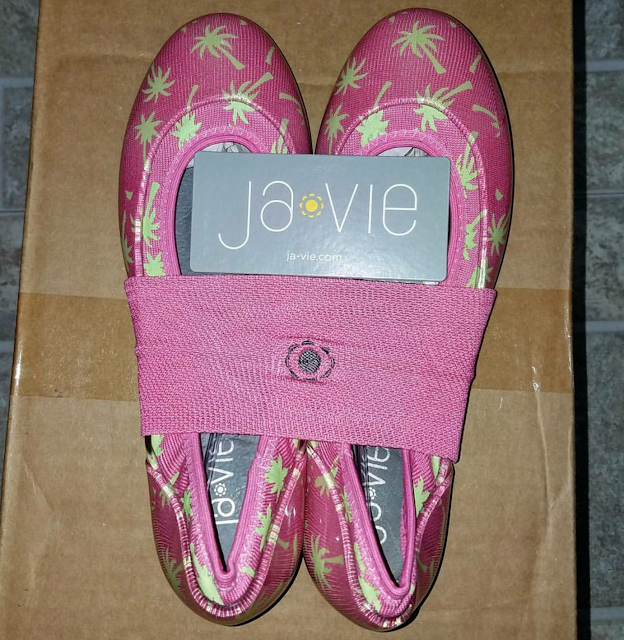 It was very exciting news to find out that I would get a pair of Javie flats to review. If you go to their website you will be floored with all the fun prints that they have available. Making it very hard to pick that perfect pair, they all look so cute and perfect addition to any wardrobe. I love pink and was planning on spending my Summer days in flats, so I decided to go with the Palm Tree Flats. 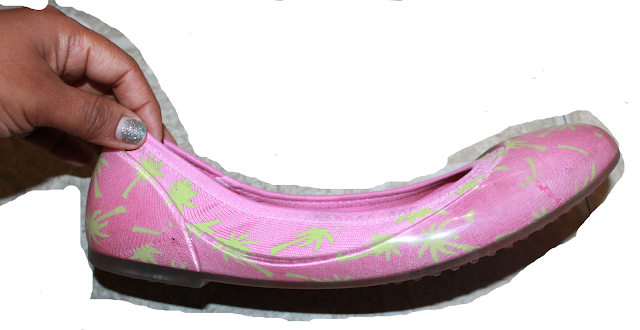 The perfect pop of pink and cute palm trees, what more says Summer like these fun flats. The unique thing about Javie flats are that the outer sole is made of jelly and they are lined with a knit lining (available in more than 20 colors and designs) that is made out of 100% breathable cotton that helps make the shoes blister free. I've spent a good amount on flats before, but this is the first time that a pair of flats has the cushioning that these Javie flats have. Just look at the cushioning in the arch area, and ball part of your foot. These leather insoles are perfectly cushioned to keep your feet comfortable all day. Your feet will thank you at the end of the day. Some shoes need to be worn in, the Javie flats I wore right away to a blogger event where I was on my feet for about 7 hours, bandaid free and not one bruise or blister on my feet. Not only was I happy but my feet were in heaven at the end of the day. They haven't left my feet since, this pair was taken with me to Mexico. Where I got to walk in dirt, mud, and rain. Thanks to the outer sole part of the shoe being jelly, they are so easy to clean. All you have to do is remove the leather insole, rinse with cold water, place in a delicates bag, wash in your washer machine and air dry. They are also easily washed by hand, I did that in Mexico and they were ready to wear again about 4 hours later. People have complimented me on my shoes and asked where they could get a pair, but most importantly they've asked me if they were worth the price. Yes, they are worth the $68.00, for this price you will get an affordable pair of flats that are fun, comfortable and stylish. The only thing that I will warn you about is the time that you will spend on their website, there are so many designs to choose from that you will not be able to pick one, and if you end up picking two pairs I don't blame you at all. Make sure to follow Javie on their social media sites, that way you will stay in the loop when new designs come out and when sales go on. 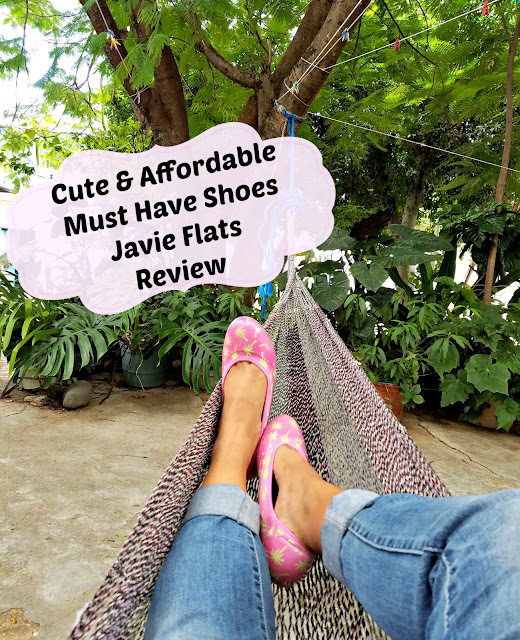 25 comments on "Cute & Affordable Shoes Javie Flats Review"
These flats are so adorable and they look so cute. I think they are great for dressing up any outfit. These flats are so pretty and they look very comfortable. I love that there are cushions to support your feet. So adorable and I am swooning over the pink! THen I saw the green palm trees and was in love! And they're comfortable too? Sold. I've never heard of this brand before but they look super cute AND comfy! I like the little cushions in the sole! The shoes look cute and exclusive. Something interesting to make a style statement. I've never heard of this brand of shoe. They look so comfy. The pink goes great with the jeans. So cute and they look really comfortable! I am a person that loves my heels and rarely wear flats - but I am going to be on the look out for these! They look so well padded compared to other ballet flats. I love the pink design too! Okay those are too cute for sure. I do love me a good pair of shoes for shopping in. These are so cute and I love the palm tree design. The colour is lovely and it does look like it has a lot of support in comparison to other flats! These shoes are adorable and they're perfect for travel as well especially if you're trying to save some space on your luggage. It's looks really comfy! I have a hard time wearing flats because they never seem to have enough support for me. These look awesome! I can't wait to check them out. These are super cute, and they look comfortable. I absolutely love flats!! And I just adore the print. It's perfect for summer! those are super cute! i'll have to check them out. i have problems putting on regular shoes (hip and back issues), these would be perfect. I love the look of these shoes - they are so cute, and it looks like the inside is super comfortable. Thank you for the helpful review! Oh my word. Those are absolutely darling! 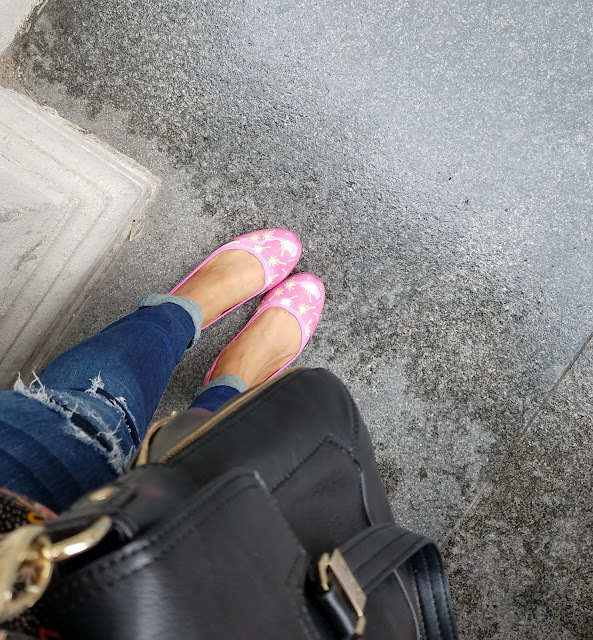 I am always looking for more great flats my feet can't handle heels anymore. With regards to solace, flats shoes are a portion of the best. Be that as it may, there is such a mind-bending concept as being too level. A couple of level shoes with thin soles can really make harm the foot over the long haul.I find this website for Flats Arch Support.If you want you can visit this site. Amazing shoes looking beautiful, the Design of these shoes really incredible. Thanks for sharing this guide with us. Security Guard Shoes Manufacturers best company in india. I've never heard of this brand of shoe. They look so comfy. The pink goes great with the jeans. if you share this idea on animation on gogoanme it willbe helpfull for others and you can also promote this barnd via animation videos in freee.